A complete Ayurvedic Lifestyle experience in a paradise of biodiversity. ONE WEEK to replenish yourself, tune on your nature, live at your pace. NATURE. This wild, pure and quiet corner of the island, to rebirth in your own nature & reset in your core. TIME to relax & renew. Hike the coastline, swim in salted crystal clear sea and relax at the warm pool. The RHYTHM of daily Yoga and Massage sessions opens up your tissues and supports your experience. AyurYOGA, for Prana to circulate harmoniously. MASSAGE, tailored on your needs. The FOOD created as Ayurvedic Vegetarian Meals, is fundamental medicine & part of the magic healing. 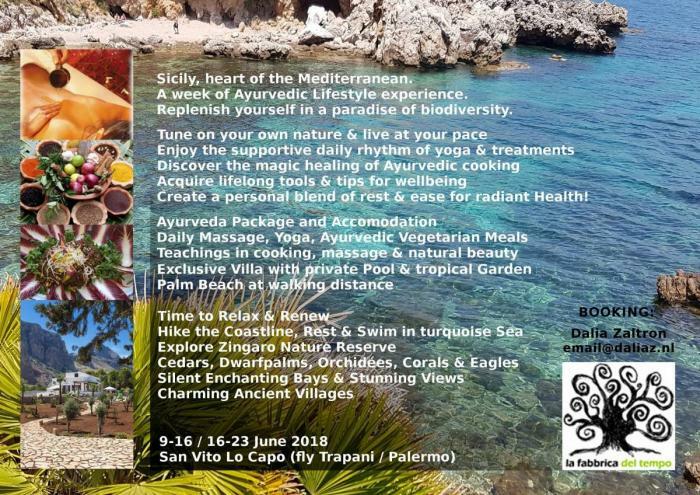 TEACHINGS in cooking, self-massage and natural beauty.
. takes place in the HEART of the Mediterranean: lush dry tropical climate, warm (swimming) temperatures, fresh air and starry nights.
. is very PRACTICAL. I love to give the opportunity to live Ayurveda on a daily level, which is the most important thing if you opt for lasting effects. I offer an Ayurvedic daily practice (cleansings, yoga, self-massage, herbal understanding, food preparation, beauty care, etc.) that you can take as much as you want into your day, also for later. We can say you can easily "rehearse" here what you may want to implement later at home.
. challenges you to balance activity and stillness in a PERSONAL BLEND of rest & ease for your own radiant health. In Ayurvedic eyes & knowledge, Health & Happiness is a personal formula to be tailored individually.
. is about EXPLORING RELATIONSHIPS (with yourself, your hunger, your organs, your sleep, your surrounding, your dreams, your needs, emotions, power, qualities, essence) and there is plenty of SPACE for that.
. 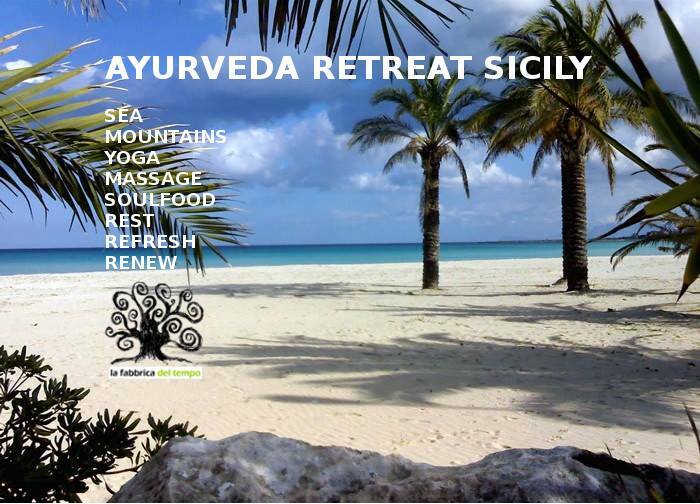 WELCOMES YOU to a trip trough yourself, in splendid surroundings.
. is not only a rich and abundant week of wellbeing, but the GREAT START of an ayurvedic experience that you can carry on with you. When the week is finished, your transformation has just started, and the tools are with you.
. AYURVEDA is born in India and rests on Universal concepts. GROUP: about 12 people max. Send me an e-mail if you are interested and want to receive more details.